SANTIAGO, Nov 3 2014 (IPS) - Combating the negative effects of its own production processes is one of the challenges facing the mining industry, one of the pillars of the Chilean economy. Now, thanks to a novel scientific innovation project, mining, which is highly criticised by environmentalists, could become a sustainable industry, at least in some segments of its production processes. 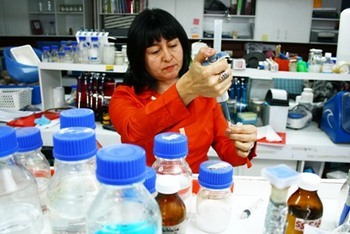 The phytotechnology project was created by Claudia Ortiz, a doctor in biochemistry from the University of Santiago. Using native plants, she and her team of researchers are working to treat, stabilise and remedy soil and water affected by industrial activities, a process known as “phytoremediation”. 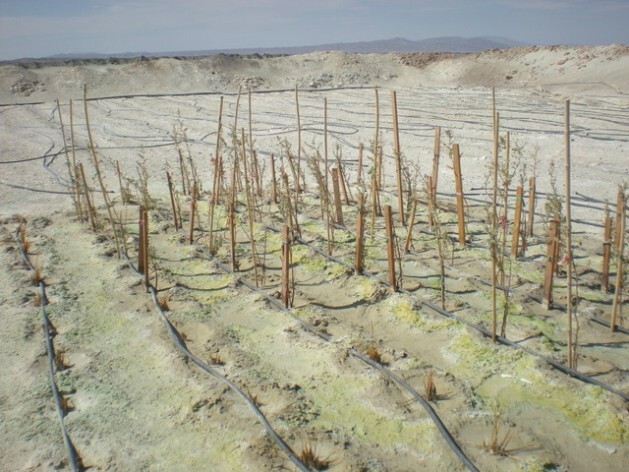 “These technologies can make a significant contribution to the environment because they make it possible to advance towards industrial development in a sustainable manner, while also contributing on the social front by making it possible to confront the undesired effects of production by involving the community,” the Chilean scientist said in an interview with Tierramérica. “We want to become a global reference point for these kinds of innovative environmental solutions,” she added. Phytotechnologies are based on the use of native plants and microorganisms, which are selected for their process of acclimatisation in economically exploited areas. In Chile, the plants used include naturalised phragmites australis and species from the baccharis and atriplex genuses. Ortiz’s research, which began in the early 2000s, initially focused on determining why some species of plant are able to grow in difficult conditions, such as poor quality soil. “We focused on tolerance of metals, and a line of research emerged that allowed us to determine that some species of plants and microorganisms had certain capacities to tolerate difficult conditions while at the same time improving the substrates or the places that were affected,” she said. In other words, the project emerged from basic research that in the end became applied research with a concrete use, she added. “In the tests that we have made on the ground, we determined that there has been an improvement in the amount of organic matter in some substrates that are chemically inert, which don’t intervene in the process of absorption and fixing of nutrients,” Ortiz explained. “There are improvements in the physical and chemical properties of the places where the plants are installed, and that is thanks to the contribution of the microorganisms and plants that have the capacity to release some compounds that are beneficial to the environment,” she added. The technology developed by Ortiz also applies to treatment of water, where plants are capable of capturing metals such as copper in the roots. “The bacteria can reduce by up to 30 percent the sulphate content in a liquid residue that has high concentrations of sulphate,” she said. So far, the pilot studies carried out by Ortiz and her team have been exclusively applied to tailing substrates. However, in the greenhouse laboratory, experiments have also been conducted in mixes of different kinds of substrates. “With respect to water, we have worked in clear water, in the tailings dams, but today we are also carrying out experiments on the ground, with leachate of water from garbage dumps,” she said. The technology developed by Ortiz is already being used in Chile, particularly in some of the processes of the state-run Codelco copper company and National Mining Company. It is also undergoing validation in Bolivia, Colombia and Canada. The preliminary results obtained in the pilot studies “are very encouraging,” Sergio Molina, the manager of sustainability and external affairs in Codelco’s Chuquicamata division, told Tierramérica. “Codelco is especially concerned with permanently incorporating new technologies aimed at minimising the impacts on the environment,” said the official at the Chuquicamata mine, the world’s largest open-pit mine and the country’s biggest producer of copper. “Based on that we have generated alliances with research institutions such as the University of Santiago to carry out pilot projects along the same lines, with which we have obtained excellent results,” he said. Lucio Cuenca, an engineer and the director of the Latin American Observatory of Environmental Conflicts, pointed out to Tierramérica that the technology developed by Ortiz addresses only a segment of the extractive process, but does not resolve all of the environmental problems caused by mining. “What it does is replace some chemical substances like sulphuric acid, but it doesn’t resolve, for example, the high quantities of water extracted in the mining process,” he said. Copper mining uses more than 12,000 litres of water per second. International institutions have found a considerable drop in the availability of surface water in this South American country. Mining is essential to Chile’s economy. In 2013, the industry accounted for just over 11 percent of GDP and generated nearly one million direct or indirect jobs in this country of 17.5 million, while exports totaled 45 billion dollars. Chile is the world’s leading producer and exporter of copper and also mines molybdenum, and gold, silver and iron on a smaller scale. The research of Ortiz and her team is also focusing on the desalination of seawater using biofilters, an encouraging alternative for the mining industry. “In this first stage we are treating water with high levels of chloride which are associated with other elements like ions, also associated with saline water. “We are working with halophyte plant species, which are very tolerant of high levels of salinity and are very good at capturing and absorbing those salts, which they store in their tissues,” Ortiz explained. “We have been experimenting and we have quite good results, for applying the technique specifically to leachate from landfills,” she added. Simultaneously, the research team is developing two projects sponsored by Chile’s state economic development agency, Corfo, involving algae and nanotechnology, to eliminate the particularly saline elements found in seawater or water with high concentration of salt. “These projects are still being developed, with very promising results, and they will be completed next year, which means we will be able to offer new technologies,” Ortiz said.